Guest: David Varadi. David is the Co-Founder and Portfolio Manager of QuantX Funds and has been the Director of Research at Blue Sky Asset Management since 2014. Previously, David was the Vice President of Economic Research and Strategic Development for Flexible Plan Investments overseeing quantitative strategy development. Before joining Flexible Plan Investments, David was the Quantitative Director for Butler, Philbrick and Gordillo in Toronto, Canada. He was also the founder of CSS Analytics, an institutional quantitative investment management consulting firm and author of the popular CSSA blog. Summary: In Episode 64, we welcome David Varadi from Blue Sky Asset Management. Sponsor: Today’s podcast is sponsored by YCharts. YCharts is a web-based investing research platform that I have been subscribing to for years. In addition to providing overall market data it offers investors powerful tools, like stock and fund screening, and charting analysis with Excel integrations. It’s actually one of the few sites that calculates both shareholder yield, as well as 10 year PE ratios for stocks. Two factors that are notoriously hard to find elsewhere. The YCharts platform is fast, easy to use and comes at a fraction of the price of larger institutional platforms. Plans start at just 200 bucks a month and if you visit go.ycharts.com/meb, you can access a free trial. And when you do, you’ll receive up to 500 bucks off an annual subscription. That’s go.ycharts.com/meb. Hey podcast listeners, happy summer time episode. Today we have a special guest. But before we get to our guest, I wanted to tell you all a reminder. We just had a new book drop this week. It’s called, “The Best Investment Writing: Vol 1.” So I can’t claim that I wrote it, because I was just the editor and compiler, but it contains 32 hand-selected articles by yours truly. Some of the best pieces from some of the most respected money managers, investment researchers in the world. They were written in 2016. Some highlights include: strategies that produced some of the highest historical returns, five due-diligence questions to ask before investing. Why we often make poor complex investing decisions, and the easiest and most powerful method to estimate future stock returns. Lot’s of great authors in there. People we’ve had on the podcast and some we hope to. People like: Jason Zweig, Raoul Pal, Professor Damodaran, Ken Fisher, and even John Mauldin. So check it out, it’s on Amazon. Let me know what you think. And it’s good summer time reading. So now we can transition to the show. I can’t wait to chat with our guest, because he’s pretty quant-y like your host. He’s from Blue Sky Asset Management. David Varadi, welcome to the show. David: Thanks a lot Meb. Glad to be here. Meb: So David’s calling in from Canada. He’s the Director of Research and also a portfolio manager, and I know he’s even, used to work with some of our friends we’ve had on the show. The Butler, Philbrick, Gordillo crew from ReSolve. Why don’t you give us just a quick overview of your background? For those who aren’t familiar and then we can cannonball into the quant pool after that. David: Sure. Thanks a lot Meb. Yeah. Just a bit of my background. I originally started as an investment advisor many, many years ago at RBC Dominion Securities. Which is Royal Bank of Canada here, up in Toronto. And then I transitioned to doing consulting for asset mangers. I launched the CSS Analytics blog. Started doing some consulting for asset managers, hedge-fund [SP] managers developing trading strategies. You know, sorta got to be known as a geeky quant. From there, you know, I got to know a bunch of people in the industry. I ended up going to work for Butler, Philbrick and Gordillo, now, ReSolve Asset Management. A bunch of great guys here in Toronto, and I helped them out with, you know, designing various asset allocation algorithms and strategies. From there I moved to Flexible Plan Investments, which is based in Michigan. Which manages a ton of different strategies, services advisors. Got to know a lot about that business as well, and then I joined Blue Sky Asset Management in 2014. Where we began as a separate account manager, and then we transitioned to launching five ETFs as QuantX funds, you know, at the end of January this year. Meb: Great. and, investors listening, these funds kind of burst on the scene, you know, from a new fund company to have five successful funds is pretty rare. And so I encourage you to check those out. But we’re gonna talk a little more about research today. Why don’t we get started? I was, you know, kinda perusing the website. And a couple of comments on there that’ll kinda help talk about the framework for how you guys see the world, and then we can get into specifics. But a couple of comments. You know, one, you said…you were talking about time-frames. You said, “…unlike endowments, investors don’t have an infinite time horizon. For this reason we believe the traditional strategic asset allocation approach, based on modern portfolio theory is sub-optimal. And rather we favor a dynamic approach to asset allocation. We believe a systematic, quantitative approach is necessary to avoid emotions and biases in decision making.” I mean, I love all of that. Why don’t you talk a little bit about y’alls general framework, and how you, kinda, think about the world? And then we can get into a little more specifics later. David: Sure. That sounds good. I mean, I think just going back even to my early days in the investment industry, I think one of the perennial problems that I always saw is that it’s easy to be a buy-and-hold investor, as long as the market’s going up. But when it’s going down, it makes it very difficult both for portfolio managers and for investors to be able to stay the course. So, you know, this problem becomes magnified if you’re close to retirement or you’re actually in retirement, you know, both mathematically and psychologically, where you have a 50% drawdown, as you’ve just entered retirement. Or if you have a 30% drawdown with a 60-40. I mean, it’s absolutely devastating, psychologically and financially. So what I came to realize was that managing risk, early on my career, was that managing risk is absolutely critical. It’s critical, you know, mathematically and psychologically. If you look at the history of markets, you know, markets go through a wide variety of different cycles. You know, sometimes you have like the ’70s, where you have rising interest rates, you have a lot of inflation. You have situations like the ’90s, which is kind of like a Goldilocks scenario. Where inflation is low and the market’s rising. You know, you have a situation like the ’30s, where you have a great depression. Just a wide variety of different market scenarios. I mean, 2008 is the most recent example, I mean, and also 2001 and 2002. We had these, you know, terrible drawdowns in the market. And, you know, you need to be able to adjust and adapt both to equity bear markets, but you also need to be able to adjust to interest rates, and you also need to be able to adjust to inflation. And so, you know, all these factors are actually critical. So you can have a good strategic asset allocation, but it’s really designed for the law of averages. So it’s designed to be…especially if it’s well designed to perform in a mix of different conditions. It’s designed to perform well in average. But that doesn’t necessarily mean for that specific investor. Because, you know, you don’t have the luxury of the law of large numbers on your side. And so, you know, like an endowment that has 30 to 50 years. You just can’t…your life can even change substantially during retirement or prior to retirement you know, whether you have a change in your career or things like that. So if you have a dynamic asset allocation, you have the ability to be more in-tune with the market regime that’s currently going on. So if it’s an equity bear market, you have the ability to de-risk your portfolio and hold more fixed income. If inflation is rising significantly, you have the ability to allocate more to real assets and commodities. You know, and if equities are doing extremely well and it’s a low-inflation environment, then you have the ability to increase your equity exposure. And so, a dynamic asset allocation isn’t perfect, but you know, it allows you to be more in-tuned with what’s currently going on, and it’s less dependent, in our opinion, on the law of large numbers and luck. So we like to minimize that factor as much as possible. Meb: And so you guys wrote a great whitepaper called “Dynamic Asset Allocation.” We’ll post the link to the show notes. So tell us what you mean when you say dynamic? You know, does this mean you guys just, you know, wake up once a month and say, “Hey, we feel like we need to be dynamic? What’s the kind of framework and rules that underpin a lot of the systems that you guys put in place? To switch from, say, a buy-and-hold strategic allocation, to something that is adaptable? David: That’s a great question. A lot of it goes back to I guess the fundamentals. Many of which you were a pioneer in laying out a lot of those fundamentals, which is, you know, taking a look at trends and momentum, as, you know, certainly a center piece of how you want to start off with a dynamic asset allocation approach. And you want to, you know, take a look at the trend and momentum to determine whether you should be invested at all in a specific asset class. And you should be taking a look at relative momentum across asset classes, as a guidepost, you know, to which asset classes you should emphasize, more or less. So I mean, broadly a dynamic asset allocation approach could incorporate any type of information. To change its allocations of function market conditions. But generally speaking we tend to emphasize, you know, momentum and trends as the center piece of that, and to some extent we also take a look at volatility. Like, how does that all come together, just from a 10,000 foot view? How do you guys think about it? Or is the volatility used in the position sizing? Is it used as a signal? How does it, kinda, all come together for investors listening? David: Yeah, it’s a great question. I mean, first of all we start with some type of a strategic allocation that, kind of, reflects, you know, longer term assumptions and reflects, you know, the unique constraints that we have running ETFs. You know, we use that base strategic asset allocation to start the dynamic process. Meb: And what’s an example of that? It would be like, you know, X amount in U.S. stocks and foreign. Do you have any sort of base that you start from, or does it depend on…? David: Sure. It really depends on the fund. But, you know, just as a general example, if you had 60% in, you know, domestic equities and you had 20% in international equities. You could use the other 20% to allocate to the best-performing asset class, as an example. You know, what we tend to do is we don’t allow most of the funds or strategies to completely allocate to one individual asset class. But rather to vary or shape the portfolio towards the better performers. And so, that’s typically what we would do. And so you can imagine almost bands around those allocations I gave you as an example. You know, the 60 could move to 70 and you know, the 20 could move to 30. So there are a wide variety of ways of actually doing that. But that’s typically how it’s done. Meb: And you mentioned volatility. How is that incorporated? Is that a signal, is that a way to figure out the position sizing? How do y’all think about it? David: We don’t typically use volatility for the position sizing, because you know, we find that, you know, when you provide a strategic asset allocation as a base, then it’s less necessary to do so and it creates a lot of turnover and complexity, with respect to managing the actual funds. But, you know, in terms of volatility what we do is we use it to determine…you know, so if you look at time series momentum as an example, most people think it’s a binary event, it’s either on or off. So if your, you know, your absolute return, return of the underlying market is greater than cash, then you know you’re in the market. And if it’s lower than cash, then you’re out of the market. We think that obviously that’s a good base, but what we view that as, if we take a look at the volatility of the market, we can actually take that and convert it to a probability. And so, you know, what is the probability of outperforming cash? You know, is it dip[SP]? If we look at whether the market’s outperforming cash, that’s a 50% probability. But if it’s actually outperforming cash by a larger margin, say 2% or 3% or 4%, and volatility respectively happens to be quite low, then that would increase the probability that you would outperform cash. Conversely if volatility was really high, then the signals that we’re getting you know, could be, you know, quite noisy. And so, you know, you could oscillate around the zero line, so to speak. And so we consider, you know, volatility, you know, to generate our signals, to minimize transaction costs. And so, one of the ways that a lot of people do it is, to minimize turnover, is to use monthly data. And so we wanna be as responsive as we can. And so, we like to use, you know, daily data where possible and instead use volatility in this probability, to better manage turnover. And so what I mean by that is that we would, you know, enter when the probability is high, data markets outperforming cash, and exit when the probability of cash outperforming that market is high as well. Meb: And so how does it kind of all come together? So are you looking at this whole portfolio? You know, looking at macro markets. So you’ve got S&P, treasuries, high yield, commodities. All that good stuff. Are you measuring kind of the relative strength across all of each other? Are you, kinda, looking at them independently? How does it, kind of, end up looking in practice? David: Yeah. In terms of the relative strength aspects, I was just talking about the sort of risk management or absolute momentum type aspect of things. But in terms of relative aspect, you know, we like to look at other markets, to determine what the return is for an underlying security. So for example, I mean, you could use the bigger markets such as the S&P, and high yield, and commodities, and treasury markets to define what the return is for any individual market. So for example, real-estate might be some combination of the return of, potentially, the commodity market, potentially treasury market, as well as exposure to equities. And so, it’s kind of a hybrid asset class. And so a lot of asset classes have hybrid characteristics. You know, we use those multiple markets to help just reduce the noise in estimating what the actual return happens to be. Meb: So how’s the world look to you guys right now? I assume the positioning, we’re in a romping, stomping, equities bull market, and foreign is catching up. Is it something that a dynamic allocation is mostly equity exposed? What’s the, kind of, the strategies positioning, sort of, as we speak summer of 2017? David: I would say most of the strategies are highly-exposed equities and have been. I mean, to the extent that, you know, different strategies have different degrees of diversification. So different strategic asset allocations, so to speak. But generally speaking the dynamic tilt is generally towards equities. And in terms of the risk on indicator of probability of outperforming cash, I mean generally speaking, that tends to be high across the board. I mean, I think it’s a market that’s definitely going upwards and volatility is obviously quite well right now. Meb: We recently had William Bernstein on the podcast and I was laughing because I said, “Dr. Bernstein, what percentage of investors do you think can implement their portfolio on their own?” He said, “I estimate 99% cannot. For various reasons. You know, emotional challenges as well as others.” But you’ve been implementing these strategies for awhile, both through clients and I’m sure individually. Like, what sort of practical challenges does an individual face trying to follow this style? Is this something you’d say, “Look, just forget it. Just outsource it.” Or what are some of the best ways to meet some of those challenges? David: It’s a fantastic question, because I think, you know, what I have seen at a wide variety of firms, in terms of, you know, whether it’s advisers or individual clients and how they go on to [SP] different strategies. You know, one of the biggest challenges is tracking error. I think that, you know, the more active, and, you know, so called tactical you are a dynamic. The more tracking error you’re gonna have. And so, that tracking error will be a function of the underlying asset classes that you have in your universe. And it’s also a function of how frequently you trade. Higher tracking error, if you’re holding 100% of your fund in commodities, as an example, you’re obviously not gonna look like the S&P 500. And so, you know, if that happens to be what you think is the best performer. You know, if you rotate, you know, rapidly between emerging markets and high yields, I mean, same difference. So the underlying universe that you have, and the degree of which you’re dynamic, will influence this tracking error and will make it difficult for investors that are really focused on conventional indices. And the other factor is that when you’re managing risk. I mean, managing risk on a dynamic basis is really a way of manufacturing cheap insurance. That’s the way that we like to look at it. But, you know, the cost of that insurance is the tracking error. So a lot of times during a bull market, you know, you’ll de-risk and invariably it will end up being…the market will go back up and then you’ll get back in, and you’ll miss part of that rally. And so, you know, that’s going to create some tracking or it’s gonna create some angst for the end-investor. So I think the end-investor has to ask themself, what is most important to them? You know, do they want to reduce the drawdown in a 2008 scenario, substantively? Because that’s absolutely critical to them, and you know, if so, are they willing to take the tracking error associated with that. That’s really the balance between those two things. Meb: We say both investment approaches are hard. We’ve often said that buy-and-hold is challenging because of the long drawdowns and which often coincide with recessions and bad markets in general. But trend-following and other types of investment strategies, that look so different, are hard for another reason. And that’s reasons like many probably would have felt in the last couple of years. Where anything underperforms the S&P 500 and just looking different, while certainly your neighbors and friends are getting rich or performing well, is equally as hard as sitting through a drawdown. One of the things, your white paper, I thought was really cool. That I actually hadn’t seen this before. I have seen similarities. It shows a chart of the top 10 money managers with a 20-plus year track record. And six of these were Quant trend shops, and with the top three all being Quant trend, sort of, shops. By the way, of the six there is a couple of more that are macro, which you could probably lump in to partially trend too. Buffett of course is on the table, but is all the way down at number six. With these sort of results, why isn’t every investor familiar with trend and momentum? Why do people love talking about Buffett, but probably almost no one listening to this podcast could name most of these other traders? What’s the thought behind that? Do you have any insight? David: Well, I guess a couple of things. I mean, first, the fact that it’s not widely used and not widely known is partly why it continues to work. I think, you know, the fact that most investors are buy-and-hold. I mean, there is no magic. I think if everyone decides that they definitively want to follow momentum and trends, then the profitability or costs of that, ensures like the profitability of using relative momentum and the cost of insurance. Profitability will decline and the costs will go up. But I think that, you know, most people, you know, have a passive asset allocation. That’s certainly one of the reasons why it continues to work. Furthermore, the psychological behavioral areas also contribute to permitting that to work. But I think it is psychologically difficult to execute. I think that that’s, you know, just like, you know, many other factors. I mean, there’s no silver bullet in investing. Everything has its own challenges. I mean, if you wanna be a value investor. You know, you’ll have years where value will be out of favor. I mean, I think if you’re a trend or a momentum investor during certain types of years, you know, sideways-type markets especially, you know, you tend to have more challenging situations. You know, I think the reason why a lot of those investors on that chart are there, is because, you know, when you stay in tune with what’s actually happening in the market, you’re much more likely to survive over a long period of time. And so I think that that’s, you know, one of the reasons why it continues to be a very effective and durable approach. Because you’re not saying, “Well, this is what the market should do,” while it’s doing the opposites. You know, I mean, people like that will eventually just go out of business. It’s a great approach, but it is difficult to stick with. Meb: There is a great chart Mike Covel has that compares DUNN Capital, Florida based CTA, who’s had exceptional returns, but a lot of volatility as well. 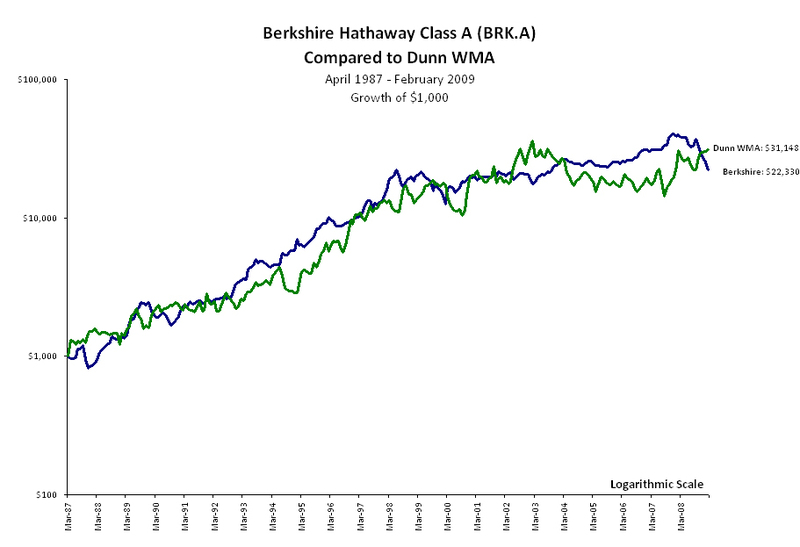 But so has Berkshire, that compares it to Berkshire over the years and it’s really close [SP]. I’ll see if I can dig it up. But I was laughing while you were talking because, I was looking through this chart and there’s a lot of familiar names on here that are pretty famous, to investors. But these guys have made so much money for so long, they’ve all compounded at 20% or more and we’ll link to a post that Wes Gray did on the impossibility of compounding at 20% plus. Basically the takeaway is you end up owning…you end up becoming one of the richest people on the planet, if you can compound at 20% plus for a long time, and that’s actually the reality here. I’m looking, so Tudor [SP], he’s built a new basketball stadium at my alma mater and owns a ton of conservation land. Then I look down the list, John Henry, he owns a baseball team, the Red Sox. And then Louis Bacon’s more capital. He owns a frigging ski mountain. It’s actually on my bucket list of places to ski, Taos. And there is about four others, I could go on. Anyway, it’s a fun list. We’ll add it to the show notes. But trend-followers kind of fly under the radar. But some that have been around for 20-plus years, really spectacular track records. All right. Let’s switch gears a little bit. There is a time I saw on y’alls website and some of the research pieces, didn’t mention the phrase dynamic beta. I was wondering if you guys could kind of define that or talk a little bit about what that phrase means? David: Sure. I mean, I think dynamic beta means that, you know, just generally speaking that the beta factor exposure of the underlying portfolio, was gonna change, you know, just like dynamic asset allocation, dynamic beta is where you hold a bunch of stocks and the factor exposure is gonna change frequently as a function of market conditions. So that’s what we look at as a dynamic approach. I mean, you know, more formally, it means having some way of, you know, for example switching between higher and lower beta securities as a function of market conditions and also determining which stocks you wanna hold, as a function of what their factor exposure happens to be. Meb: I was curious because I hadn’t seen that before. I like it. There is something you guys do, all right, for those listening that are in your car, or at the gym. You may have to get off the bike and pay attention and hit rewind a few times. Because we’re gonna get a little deeper. Taking my shovel out and we’re gonna go down the rabbit hole. You guys talk about using option data, which is not something, as a way to inform portfolios and ideas. Why don’t you talk to us a little bit about that? Because that’s not something we’ve talked much about here on the podcast. What’s the ideas there? David: Well, I think the idea is that you know, you wanna incorporate…I think when you invest in individual securities or individual stocks. You know, there are so many different pieces of information you can incorporate. You can take a look at fundamentals. You can take a look at technicals, and so how is it that you’re able to capture all of this information? Initially, you know, when I looked at the problem I was thinking, okay, well, multi-factor model is probably the solution. And then you get to thinking that, okay, well, now I have to figure what do I incorporate in that model, and how do I make that model dynamic? And so, you know, you start to realize, you know, as a Quant, that it’s a very difficult problem. So you start to think, Okay, well where can I get a market-based estimate? You know, something that actually takes all of these things into account, and dynamically weighs these things as a function of time, and as a function of market conditions. And so, started to look at option data. Because option data is forward looking. So if you look at implied volatility, you know, you look at the research studies, incorporates all kinds of information. In addition to historical volatility, it would incorporate momentum, it incorporates profitability, it incorporates liquidity. Just a whole host of factors. Began to become very interested in using this as a source to select stocks. And so, you know, what fascinated me is that the research was relatively robust. If you look at the research on using options to select stocks, it’s a very powerful factor. You know, seemed to be an under-tapped area. You know, what we eventually came upon was to take a look at the option market volatility, implied volatility and segregate into good and bad volatility. And so good being, you know, for those of you…a call option is basically a bet that a stock will go up. And so the implied volatility associated with a call option is what we refer to as good volatility, or upside volatility. And if you look at a put option, that’s a bet that something will go down. And put options are what people use to hedge, and we view that as bad volatility, or downside volatility. If you look at the differential between those two, then we found that that was the strongest predictor of future stock returns. It incorporated a wide range of information. And the benefit of this was that you’re getting, you know, a market-based estimate of future stock returns that incorporates all these different factors. And so we thought it was kind of an interesting angle. Meb: Did you guys come to this…? Is this in the academic literature? Is this something you guys, kinda, you know, played around with on your own? How did you end up, kinda, coming around to this because it is a little more esoteric? David: Yeah. It is in the academic literature. It’s generally referred to as implied skew or the call put volatility spread, and it is in there and it’s been supported by a wide variety of different researchers, and it’s a very robust effect. You know, there are a lot of things on the so-called volatility surface which is a geeky term for…you know, if you layout all the call option and put option volatilities at a wide variety of strike price and expirations, you get this, you know, multi-dimensional surface, which is, just, really just a big pile of information. You know, how do you extract this information to estimate returns? So we looked a lot at the academic research. We did our own research and then we determined that that was the good versus bad volatility spread, was the best predictor of future stock returns. Meb: Like, how often are you guys looking at this? Is this something that’s useful on a quarterly level, monthly, weekly, daily? Like, how informative is this signal? David: We look at it monthly. And so it’s a very informative signal and you have to balance, you know, turnover and things like that. But generally, it’s one of those signals. It’s not like a value signal. It tends to be a shorter term type signal. So it’s gonna forecast which stocks have the highest expected return, over the next month, or 30 days. It’s constantly refreshing itself, and what we found was very interesting was, is that the factor exposure of the stocks that would be selected, you know, tended to be generally in-tune with market conditions. And so, you know, whereas if you use momentum to select stocks in 2009, you tended to hold Johnson & Johnson and very conservative type stocks. You know, if you used the good versus bad volatility spread, you tended to be holding, you know, the lower quality, lower priced stocks, or companies that had huge upside, at the bottom of the market in 2009. And that’s because the option market is essentially predicting that these things have more upside than downside. You know, they have, it’s a fancy term for that, they have high implied skew. You know, we just found it very interesting and certainly worthwhile as a predictor. Meb: Is there any sort of preference between the absolute or relative spreads? Is it one that you’d prefer, or works better? Or is it in combination? David: With individual stocks what we found is that…and this is just our own findings. Momentum tends to be effective, but somewhat time varying in terms of its effectiveness, you know, it can go through, sort of, you know, good and bad spells. So I gave you the example of the 2009, whereas, momentum is doing incredibly well this year as an example. So it can be really hot or really cold, so to speak. And so this seem to be a more consistent predictor and also a more, less noisy predictor of the cross-section of stock returns. So if you use it to try to explain stock returns, so to speak. If you compare to other factors or multi-factor model, it tended to be more efficient. Meb: And if we looked at sort of an individual, putting to work the momentum stuff. That’s one thing. This seems like this would be a really challenging way to, kinda, find the data and parse it and sort. I mean, are there any commercially available sources of data for this options, sorta, stuff? Or do you gotta have a Bloomy [SP] and/or something pretty sophisticated to sift through this? David: Yeah. I mean, there is a wide variety of sources. You can use Livevol, IVolatility, you know, it is difficult to obtain, to be able to do this or, you know, to take a universe of thousands of stocks is pretty complicated and time consuming and certainly you have to have a lot of computational horsepower. So, you know, we view that as a positive thing, because it kind of creates a bit of a barrier to entry. So certainly there is that out there. Meb: A scenario that I don’t know that much about. I just spent a month long project, working with options data. Only to find out that the CBOE published, put some indices that would work for what we were doing. I think I lost a month of my life to that. So I am a little grumpy about options data, currently because it’s an order of magnitude more complicated than just putzing around with just pure equities. Look, the working world has changed. With the growth of the internet, there’s never been more opportunities for the self-employed. To meet this need, FreshBooks is excited to announce the launch of an all new version of their cloud accounting software. It’s been redesigned from the ground up, custom-built for exactly the way you work. Get ready for the simplest way to be more productive, organized, and most importantly, get paid quickly. The all-new FreshBooks is not only ridiculously easy to use, it’s also packed full of powerful features such as, create and send professional-looking invoices in less than 30 seconds, set up online payments with just a couple of clicks and get paid up to four days faster. See when your client has seen your invoice, and put an end to all the guessing games. Meb: We only have you so long. I wanted to still squeeze in a couple more questions. We have a lot of listeners that are kind of at, near, or in retirement. You guys wrote another whitepaper called, “The Importance of Managing Risk in Retirement.” You discuss a model for quantifying the risk of financial ruin. Which I think is pretty important, but includes, inputs of life expectancy, expected withdrawal rates, expected portfolio return and expected portfolio volatility. Could you walk us through the model a little bit? How retirees should be thinking about their investment horizon and risk management in general? David: Sure. I mean, I think it can be a very nuanced area. But I mean, I think that the general findings are…and this is as I said in the beginning of the call, it’s just mathematically true. Volatility is really the, you know when it comes to withdrawing money, the math is very different. When you’re contributing to your portfolio in the accumulation phase. You get to dollar cost average and essentially benefit, to some degree, from the volatility of, you know, the stock market. So you’ll buy more when stocks are low and you’ll buy less when stocks are high. You know, when you’re withdrawing, you know, you face, kind of, the opposite problem. And, you know, volatility, when you’re withdrawing is the enemy, you know, of your returns. And so, you know, when you have a nest egg. You’re trying to maximize you’re trying to maximize your probability that you don’t run out. Or you’re trying to maximize the length of time that it will last. And so when you have volatility, you can’t withdraw as much. So for example, 100% stock allocation. You can’t withdraw…if you’re expected to earn 8%. You can’t withdraw 6% or 7% or 8%, because the stock market will give you widely different returns from year to year. You know? But if you had a strategy that produced a very reliable, you know, 5% or 6% or 7%. You know, you could withdraw a larger fraction of it, and so it’s mathematically true. And just a simple example, real-life example. I mean, if you’re a tenured professor and you earn a certain amount every single year. You can spend a lot more of your money, reliably and spend it almost to the, you know, exactly matching what you’re earning each month. But if you’re an entrepreneur, you always have to save a lot of money in cash. Because your income is substantially variable and so the same thing applies. So when you manage risk, you’re managing that volatility. And so if you can manage that volatility, without substantially detracting from returns, you can substantially increase your sustainable withdrawal rate, and you can also substantially increase the probability that you won’t run out of money. Or adversely, the probability of success. Meb: It’s interesting. You see a lot of research from some of the big shops that talk a lot about fundamentals. Do any sort of macro, fundamental level inputs make their way into the portfolios? Or for the most part, are you guys kind of technically focused on the portfolio management? David: In terms of the fundamentals. What do you mean by that? Are you talking about…? Meb: It’s sort of like valuations. You know, because I was thinking about retirement. I was thinking about the challenges. You’ve seen so many studies by GMO and AQR. Where they look at the 60/40 portfolio and say, this is one of the lowest expected returns for this portfolio in the last century. They say U.S. stocks are expensive, bonds are yielding two and change. So this historical 8% return or whatever, that investors are used to, and factor into many of the retirement calculations may be, you know, a very high expectation. I was just curious, because I didn’t think it did. But do any sort of valuation or other sort of macro-based fundamentals, make their way into the portfolios. Or is it pretty much mostly price-based? David: Well the strategic allocations incorporate much of that information. You know, just notionally, I mean, we pretty much can say definitively that bond returns are not gonna be as high over the next 10 years, as they were over the past 10 years. So you need to have more equity exposure. And so, you know, I think the advantage of, you know, knowing that and knowing that you can, to some extent, manage risk. Or you can manage certain types of risks, you know, using, you know, momentum and trends, so you can increase your equity allocation at the same level of volatility. And so, by increasing your equity allocation, you know, which tends to have a higher expected return, you know, you’re likely to do better than a conventional portfolio that would be heavily weighted in [SP] bonds. So 60/40 is…if 40% is earning 1% or 2%, then that’s a substantial drag on returns. So if you can increase that to, for example, 20% fixed income and 80% equities or even more, you know, then you can enhance your returns. Meb: So we’ve held you for quite awhile. I’ve got a couple of other kind of quick questions and then we’ll start to wind down. What are you guys thinking about today? Any sort of research you’re working on? Or any sort of puzzles in your brain, that you think are particularly interesting or exciting right now? Anything in general that y’all are putting pencil to paper on and studying, up in Canada? Anything come to mind? David: Yeah. We’re looking at a wide variety of things. You know, I think right now…well, what we have done is we’re taking a look at, you know, how to decide you know, which factors might be in favor? So sort of a tactical factor allocation. And so we’ve been, you know, poking around at that. I know a lot of people said it can’t be done. But, you know, we’ve done some promising research in that area. We’ve also looked a lot…you know, very interested in strategies that can help you address tail risk. I know that you’ve obviously launched something that addresses that. I think it’s, you know, it’s a very important area and so we’re doing some research in that area. You know, just taking a look at different ways to, you know, to manage that tail risk. Because it’s a nice complement to the risk management of a momentum or trend approach, you know, which can protect you against secular moves, but it doesn’t protect you against shocks. So, you know, those are some of the things that we’re poking around at. Meb: Cool. I like all those. One of the reasons I ask, there has been a little bit of a slow summer here and I’m a little brain dead on new ideas. The last one we were working on was a bunch of tax optimization, white paper. Which is about as boring as you can get. So we love thinking over those ideas and tail risk, obviously, is one close to the heart. But keep us updated, we’ll have to have you back on the podcast when you think of some more. On a personal level, although I guess this could professional as well. What’s the most memorable trade that comes to mind? Or it could be an investment and it can be good or it can be bad. But thinking back, kinda, what’s the first thing that comes to mind when you think of the most memorable investment of your career? Meb: You can give me personally or work. I mean, mine, I’ve talked a lot about was blowing up a biotech equity straddle in the early 2000s, that cost me, like, my entire portfolio. It’s a fun story, where I had the set up where the volatility expanded into the expiration, and so the position was already in the money. And so a reasonable person probably would have taken some chips off the table. But I was very unreasonable in my early 20s. And then the drug got approved, so the one side of the option was again, in the money. So the whole reason for the trade was done, and I should have closed the position, because it made money. Then about a day or two later, I said, “Maybe I’ll just give it a day or two. To see if we can squeeze out a little extra profit,” and of course the trade went right back down to the strike price because, the company pre-announced earnings for no particular reason, and I essentially lost my entire count, and spent the next year eating mustard sandwiches. But that’s just my example. But it’s the first thing that always comes to mind for me. Is there anything in particular that…? David: Yeah, there are a couple. A couple from this year. One of which was…I’m not sure if you guys are aware. I mean, I see it a lot in the press about the Canadian real-estate market being overvalued here. Meb: …pumping the real-estate. They may have hit the exact top. I think it’s down a little bit, right? David: Yeah. I mean, yeah, I think it still seems to be going up. But I mean, I think it’s certainly a frothy area. I’m looking out my window right now, at about 20 different construction projects. But I bought…I was lucky enough. I bought puts on Home Capital Group, you know, just before it collapsed. It turned out to be just like a month before it collapsed and I managed to get out of most of it, when it was quite low and held on to some of it after Warren Buffet announced that he was buying back into it. But yeah. I mean, I think I bought the options for, I think it was $2.60 and then they went up to, I think as high as $20.00. I think that was a pretty memorable trade. Because it I think that base from the timing of it, and I was kind of eyeballing the chart, because I didn’t have anything specific. You know, I didn’t have any Quant tools to use specifically on that. But I knew fundamentally, I knew that there was some issues going on there. And so, you know, it was a memorable trade. I just literally looked at my phone one morning and all over sudden it was down 60% or 70% in one day. So that was good. I think the other one was Bitcoin. I couldn’t believe. I bought it through Grayscale, GBTC. Which is a Grayscale Bitcoin Investment Trust. I mean I just, I bought into it around, I think it was $130 and it kept on going up. I kept on selling as it was going up and it went up eventually to I think it was maybe $560 or $565 interday. It was crazy. I didn’t sell at the top. I mean I literally sold, you know, was selling into the frenzy. Because I guess my rationale was that when things go parabolic, it’s hard to use a trend approach on things, unless you’re using a really, really, short-term trend. So I was selling into strength. But I didn’t end up getting anywhere near, I guess, where it went up to. But it’s been, it was a pretty crazy ride. Meb: The cryptocurrencies has been a lot of fun. I think we’ll have to do a few more episodes on them in the future. It’s a pleasant distraction for me. I’ve never owned any, never traded any. Despite the fact that we’ve had a Bitcoin payment option on The Idea Farm for, like, five years. No one’s ever sent us any Bitcoin, so…We got a bottle of tequila though. Which Jeff by the way…podcast listeners, I want you to appreciate this. Jeff absconded home with a bottle of tequila, we never saw it again. Just kind of whisked it away. So if you send any in, you’re gonna have to address it to me. Because Jeff will just take it home and we were gonna have margaritas in the office. We went fishing around the tequila, could never find it. What’s kind of like your takeaway advice for listeners? We have individuals listening to this podcast. You’ve kind of presented a lot of really interesting ideas. Any sort of just last piece of advice, practical advice for investors on the podcast? David: Yeah. I mean, I think the practical advice is, you know, you have to sit down and carefully, you know, think through what you’re trying to accomplish. And try to blend a mix of, you know, dynamic and passive strategies, or even segregate accounts. Have something that you’re gonna, you know, not pay attention to. So that could be your passive portfolio, you know, and have, you know, the portion of portfolio that might be significant to you, that you don’t wanna have a lot of risk. You know, you can use a more dynamic approach. And lastly, you should have a portfolio that you use for special situations, that you may identify under discretionary basis. You know, so you can sort of satisfy your urge to gamble, so to speak. If you wanna buy certain special situations. Whether it’s, you know, options or exotic asset classes. So I think when you have those three accounts. It makes it a lot easier to invest sustainably. Otherwise you tend to co-mingle everything together. You know, if you’re doing one and you increase the allocation to that. You need to have, sort of, a coherent strategy, but it needs to be segregated from a mental standpoint. And you need to be very disciplined and sticking with that, to be successful over time. Meb: Wow, that’s an interesting takeaway, because we talked to podcast listeners at the end of the year, beginning on this year and said, “All right, wipe the slate clean. Start with what we call the zero budget portfolio, and write down your investment plan.” And I challenged our listeners to do it. I’m guessing about 0.1% ever did. But said the systematic approach for a lot of the main portfolio is a really pointed [SP] exercise, but very few follow with it. Which is probably going back to William Bernstein’s, 99% of people shouldn’t be doing it, comment. Because it’s a rather simple formula, but a very difficult prescription. David, it’s been a blast. Where can our listeners follow your writings in? More information on the fund offerings, if they wanna find out more. David: Sure, yeah. They can go to bsam.com, which is Blue Sky Asset Management and they can also go to quantxfunds.com to learn more about the funds. Meb: And your writing will appear on both? Do you still do the blog anymore? I used to love your blog. Is it migrated mostly to the two websites? David: Oh, thanks. No. I haven’t really been blogging too much. I have been quite busy I guess with operational items and other types of things. But I mean, I think eventually I’ll maybe write down a few different types of things. Meb: And most of your writing in the mean time, will it show up on Blue Sky, QuantX, somewhere in the ether? David: Probably show up on Blue Sky. Meb: Awesome. David, it’s been a blast. Thanks for joining us today. David: Yeah. Thanks a lot Meb. Thanks for having me. Meb: Listeners, thanks for your time listening in today. We welcome feedback, questions for the mail bag. Shoot them over to Jeff at feedback@themebfabershow.com. As a reminder, you can always find the show notes. We’ll put in some of those charts we talked about today, and other episodes at mebfaber.com/podcast. Subscribe to the show on iTunes and if you’re enjoying it, please leave a review. Thanks for listening friends and good investing. Sponsor: Today’s podcast is sponsored by FoundersCard. I usually don’t spring for paid membership programs but this one is a little different. The offering has targeted entrepreneurs and business owners, and the card enables premier benefits from leading airlines, hotels, life-style brands and business services. A few of my favorite benefits include free access to MailChimp Pro, Dashlane Premium, and TripIt Pro. You can even get big discounts at services I love, like Silvercar, 99designs, Apple, and AT&T. My favorite though, are the travel benefits where you get an automatic status such as Hilton Honors Gold, American Airlines Platinum and Virgin America Gold. And while I often use the great app HotelTonight for travel, the FoundersCard discounts can be massive too. If you go to founderscard.com/meb podcast listeners can sign up for the discounted 395 bucks a year with no initiation fee. And that’s a saving from the normal cost of around 600 bucks per year. Again, that’s founderscard.com/meb.